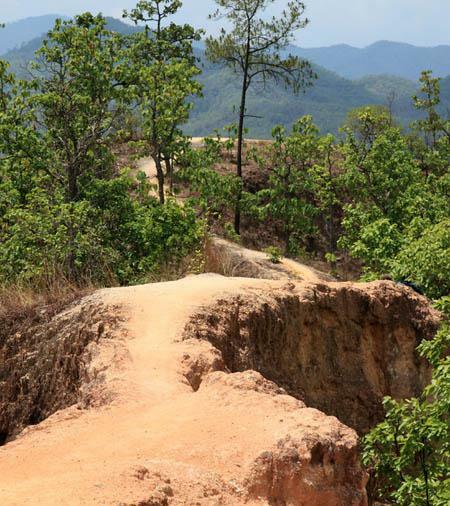 Photo Gallery of Pai (Mae Hong Son) in Thailand. 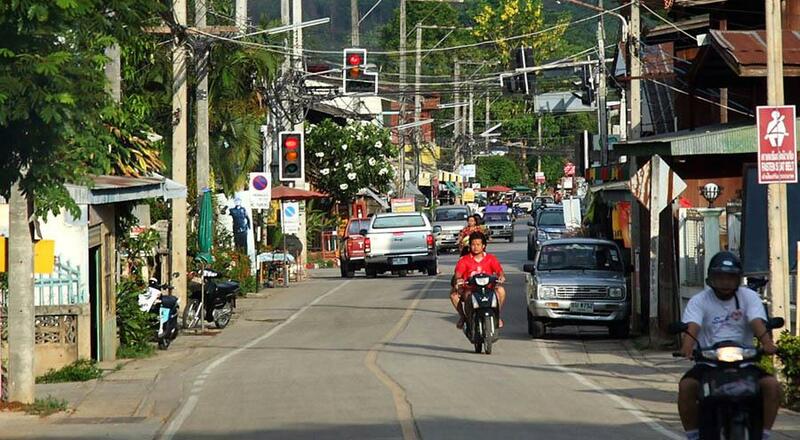 Pai is a small town in Mae Hong Son Province, Northern Thailand, near the Myanmar border. 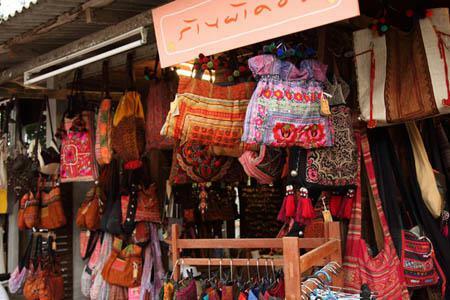 The town is located along the way called Mae Hong Son loop that is a 600km circuit that starts from Chiang Mai and goes through the province of Mae Hong Son. 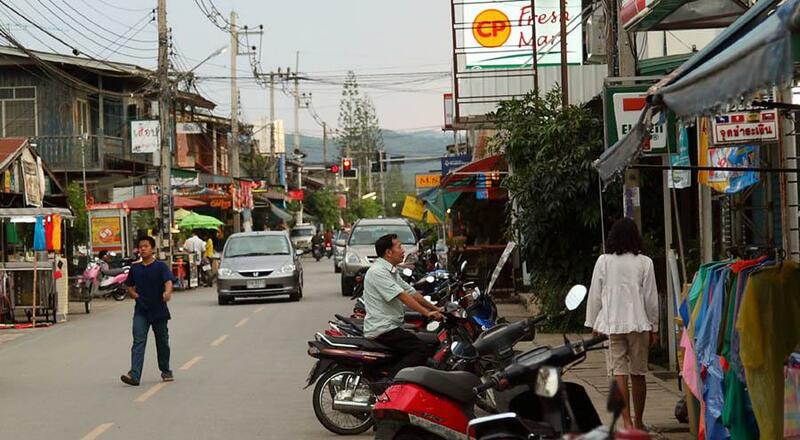 Although there are many views, the city is named after the Pai river. 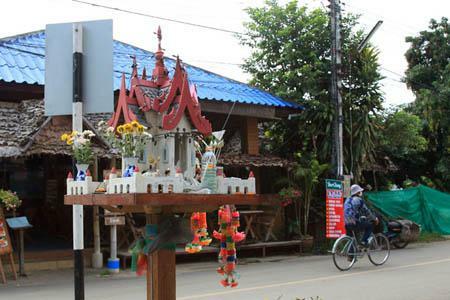 Pai was once a quiet village inhabited by Shan people (*1), however, the city is now a popular place to visit by foreigners and Thai people as well, influenced by the thai movie "Pai in Love". 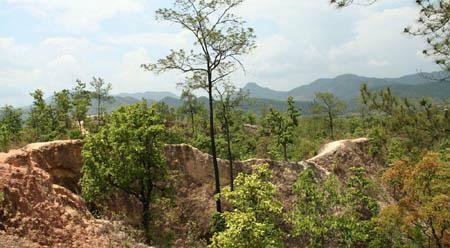 The place is surrounded by high hills ranging from 600-1200 meters above the sea level, hot in summer and very cold at night in winter. 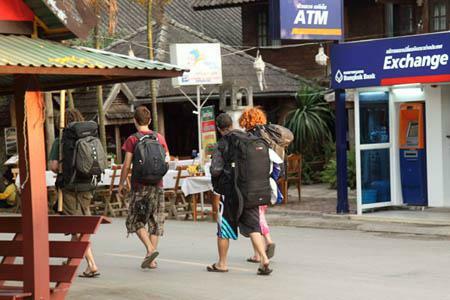 With mild climate and rich nature, you can enjoy trekking, elephant rides, rafting, kayaking and so on. 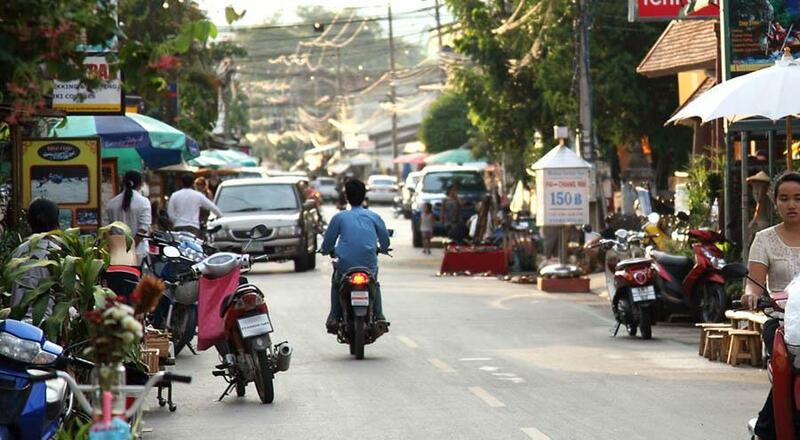 Now, let's go around the town with me. Not so quiet but a quite busy place with visitors. 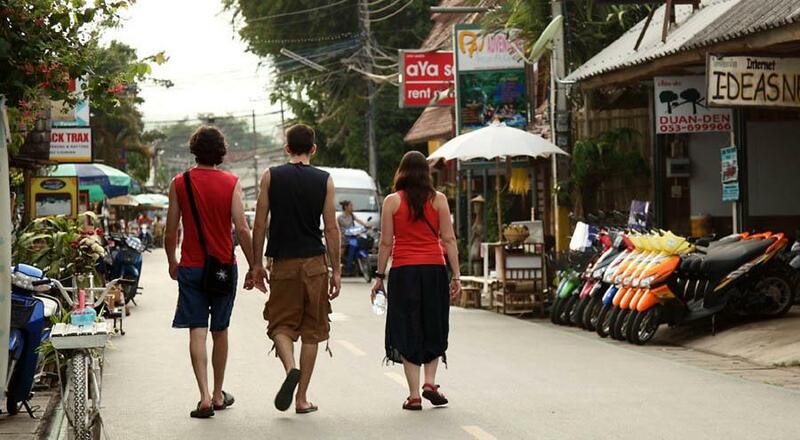 Tourists enjoy going for a walk. 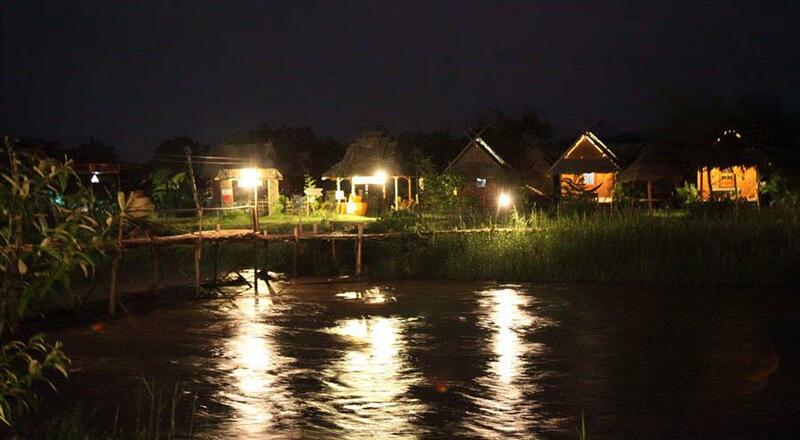 Pai river, going through the city. 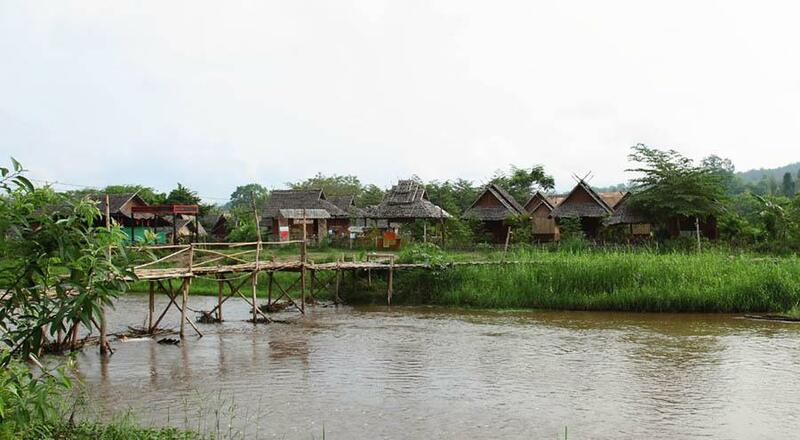 Bungalow-like guest houses can be seen over there. 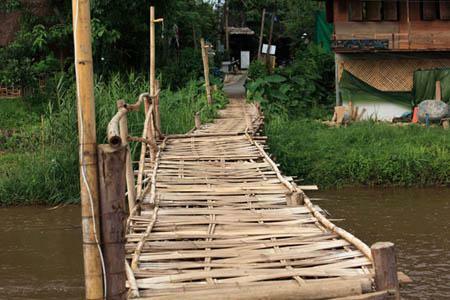 Bamboo bridge over the river. The way splits in two. 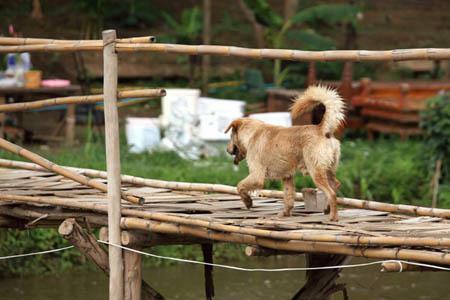 A dog was walking on the bridge. 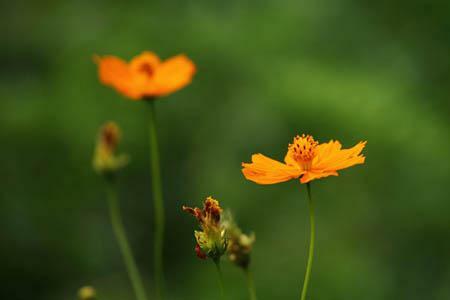 I'm wondering what kind... Cosmos ? 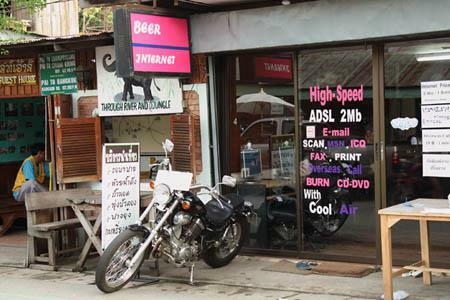 Looks like an internet cafe. 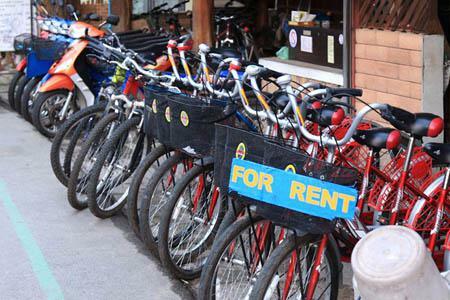 You can go to Chiang Mai or Mae Hong Son from here. 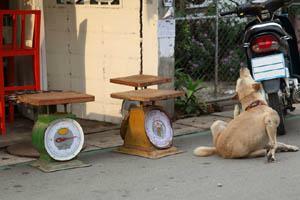 Chairs using scales in front of a shop. 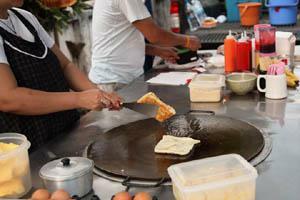 Looks yummy ! :D Chairs ? 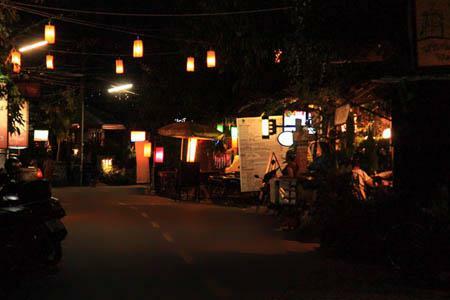 Night scenery of Pai town. Around the Pai river and streets. 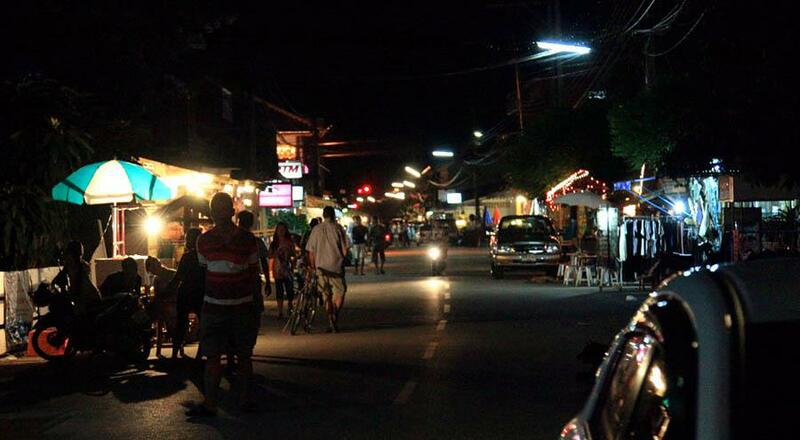 A lot of shops along the street and quite busy at night. Bungalow-like guest houses seen in the day time. 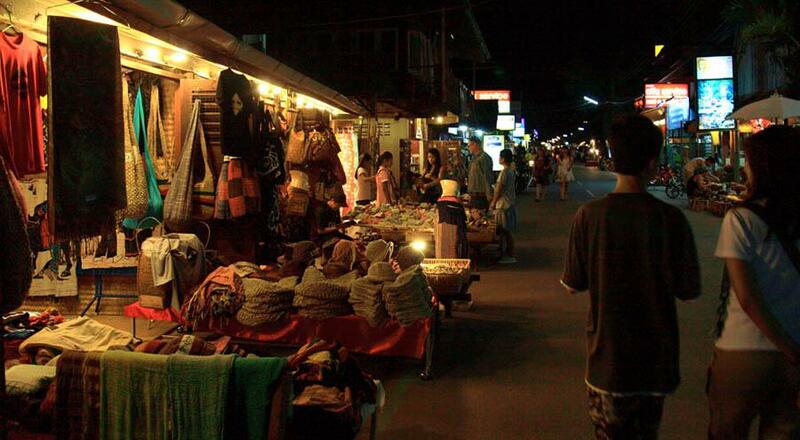 A lot of shops along the street and quite busy at night . 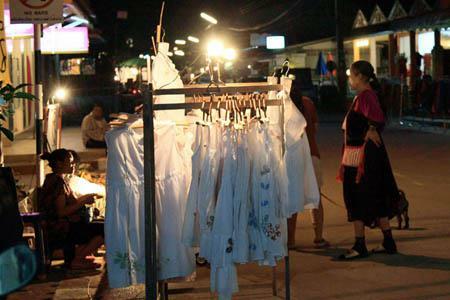 A lot of shops along the street and quite busy at night also. 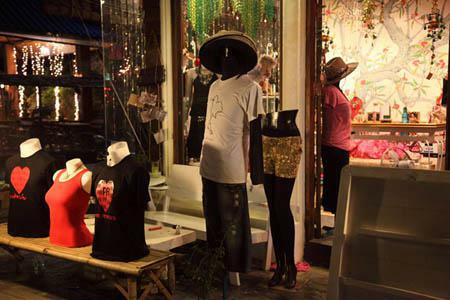 Other shops along the street. Around the river at night from the hotel we stayed. 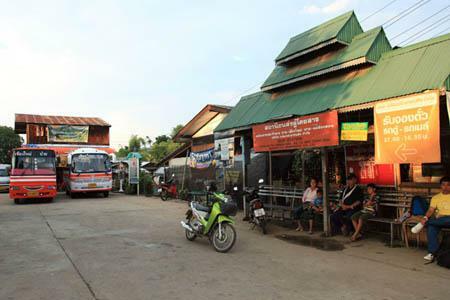 Wat Klang is located close to the bus terminal in Pai town, built in 1792 by the Burmese Thai Yai (Shan people). 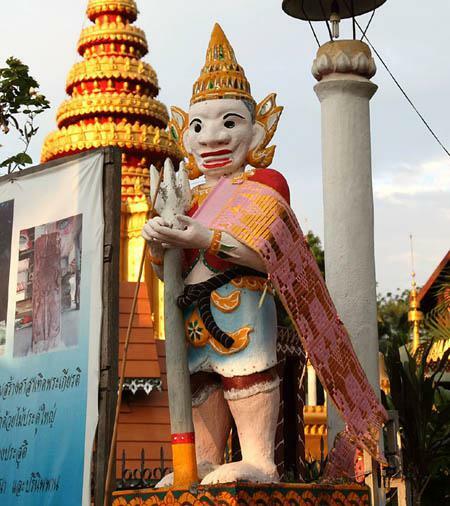 It was a deserted monastery for many years, however, Wat Klang is one of the significant temples in Pai today as it houses very old and revered Buddha statues. 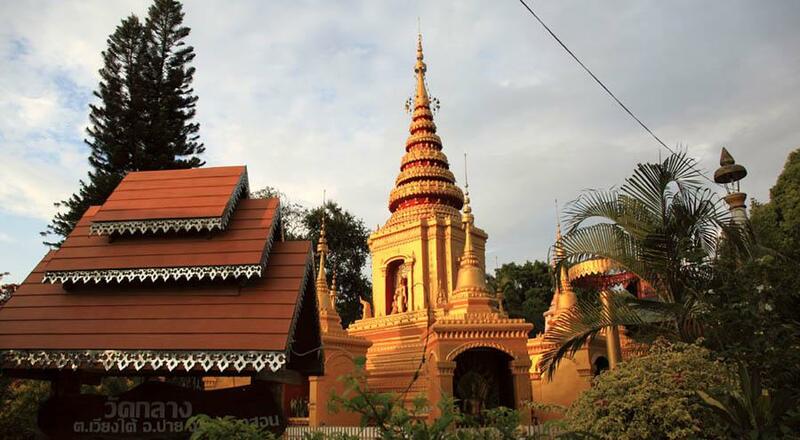 The main attraction is the striking golden Thai Yai style chedi and smaller Mon style Chedis. Buddha images of the seven days of a week in niches below the smaller chedis. 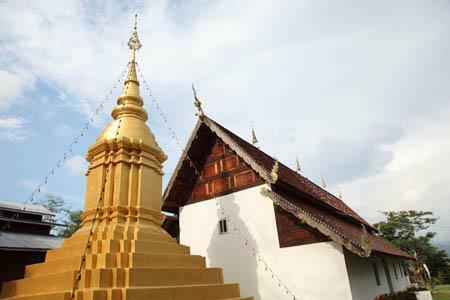 The striking golden Thai Yai style chedi. Gods protecting the entrance. 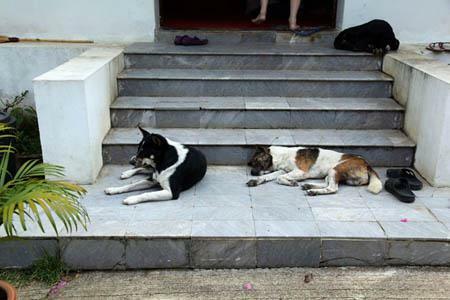 They are like Yuks seen in Grand Palace in Bangkok, but very different. Below the smaller chedis, Buddha images of the seven days of a week. 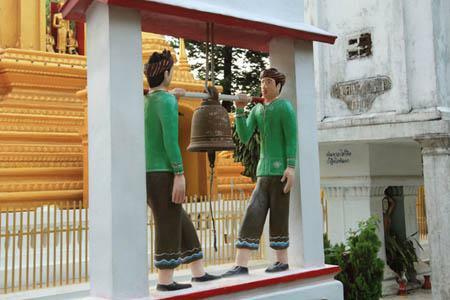 Next to the Chedi, persons handling a bell. Is this the main hall ? I didn't get in, thought. 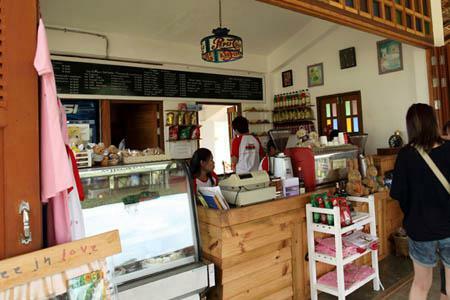 "Coffee in Love", the most famous coffee shop in Pai. 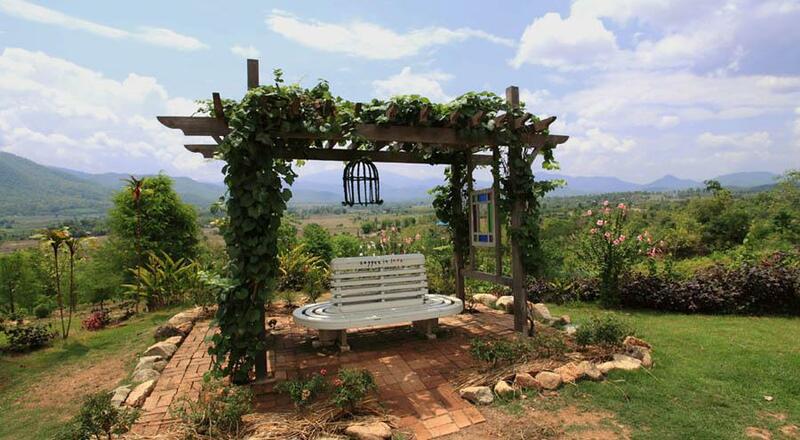 It's located on the main highway into town, just 3km from Pai town. 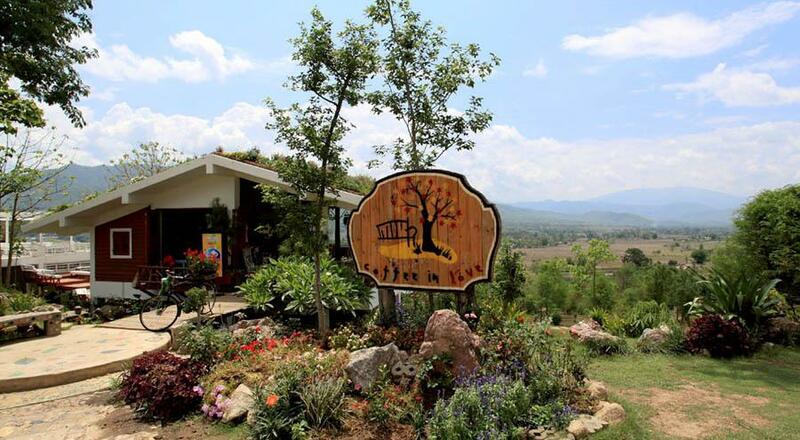 "Coffee in Love", the most famous coffee shop in Pai. 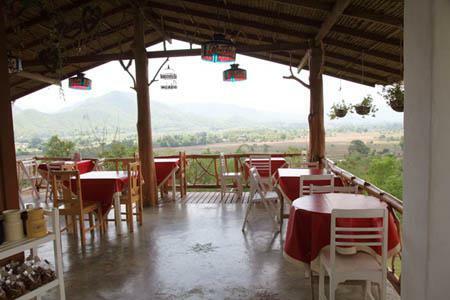 "Coffee in Love" is a beautiful coffee house that have a great view of pai valley, well-known for the Thai movie "Pai in Love" or other TV shows. 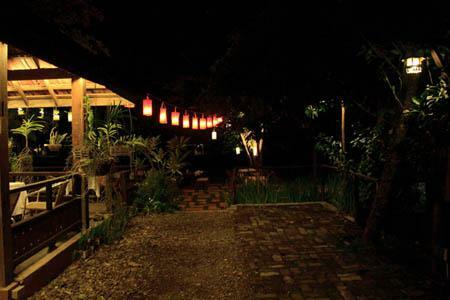 When you get tired from your trip, drop by this sweet coffee shop and take a rest for a while. 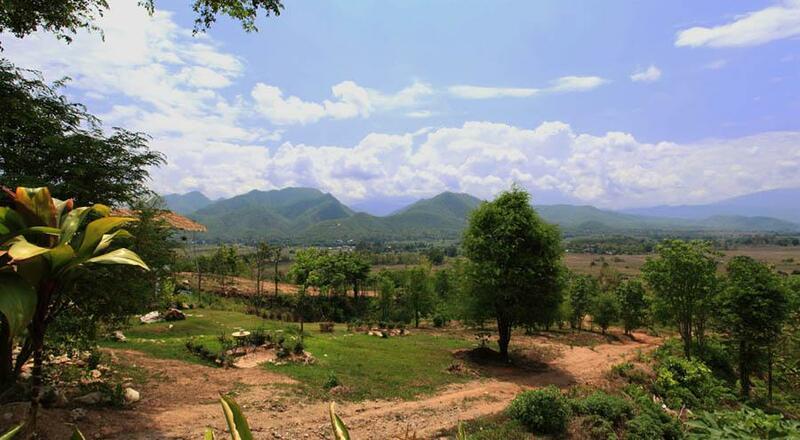 *) The movie "Pai in Love"
Check out by You Tube - "Pai in Love"
Great view of pai valley. Cute white bench. It's for photos. (I didn't feel it's a valley, but they say it is.) Cute white bench. It's for photos. 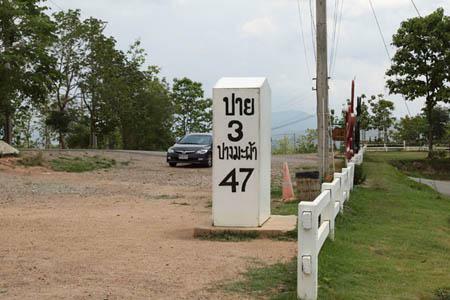 Sign 3km up to Pai. 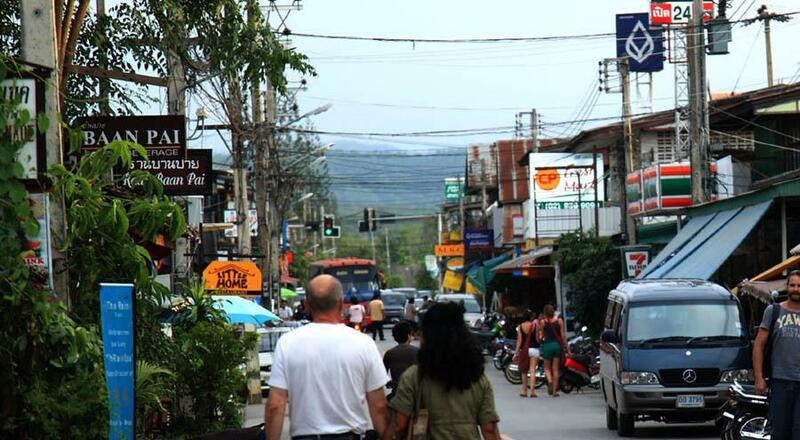 Sign 3km up to Pai. 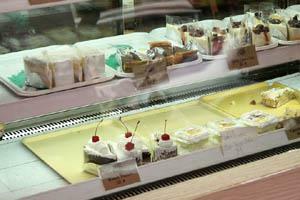 Inside the cafe. May I take your order, please ? :D Cozy atmosphere. 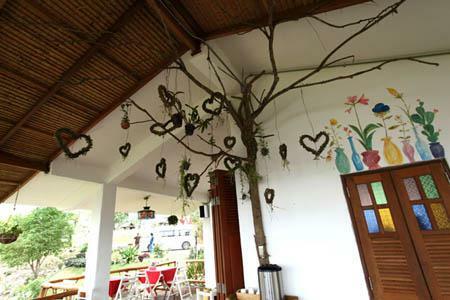 Cute heart-shaped decorations. 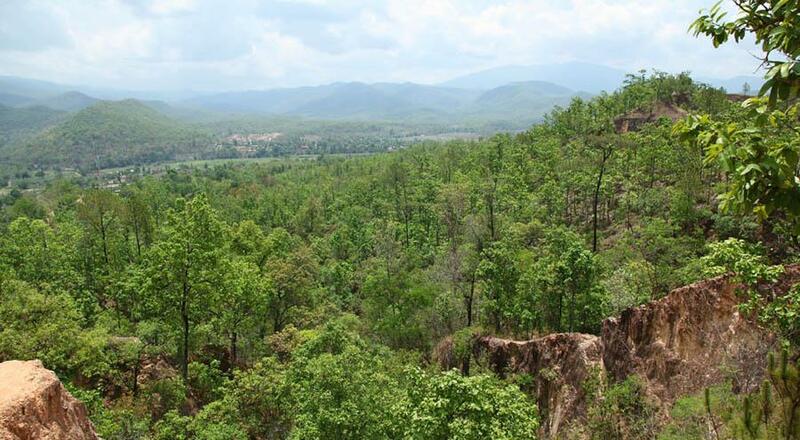 During World War II, the Japanese army wanted to have a route from Chiang Mai to Mae Hong Son to attack Burma which was a colony of the United Kingdom at that time. 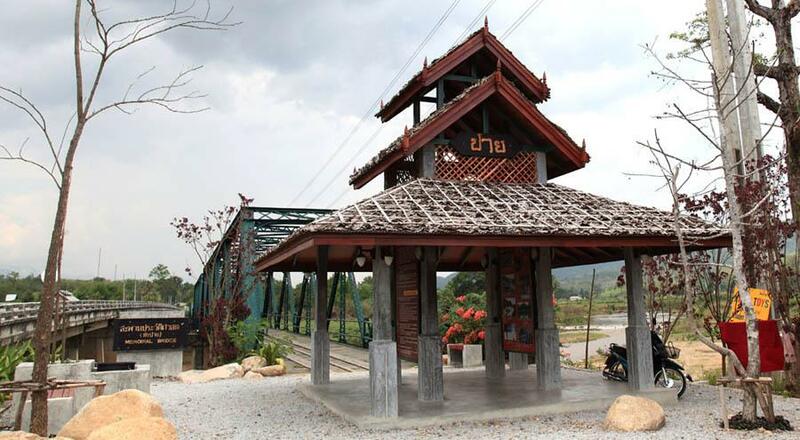 To establish the route, the bridge was built over the Pai River (Ta-Pai river near Ta Pai village) in 1941 using elephants to drag trees from the jungle and forcing villagers to work. 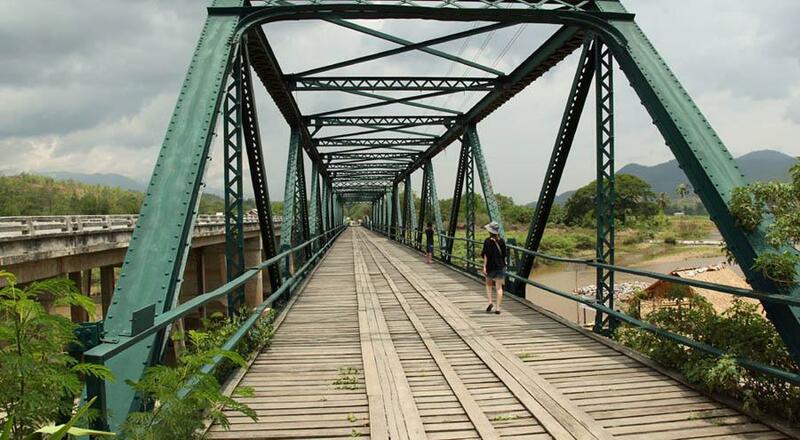 In 1976, the steel Bridge called "Nawarat Steel Bridge" was built and it still remains as a remainder of the history. After the war, Japanese soldiers left and burnt down the bridge. 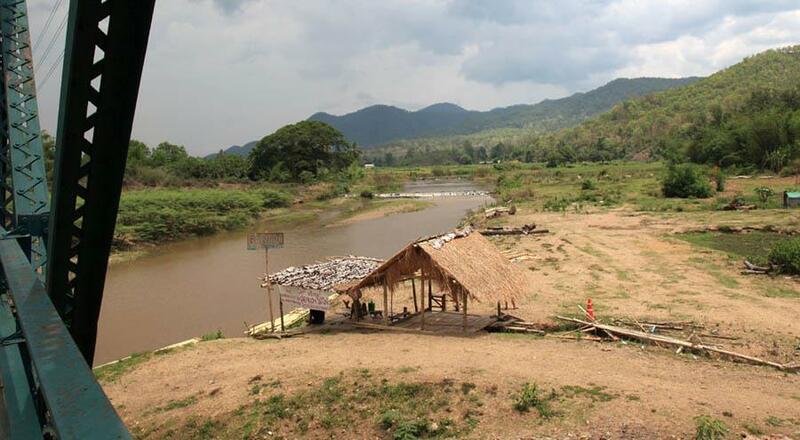 However, the villagers was in trouble because the bridge was very important for their daily life, and rebuilt the wooden bridge over the Pai river. 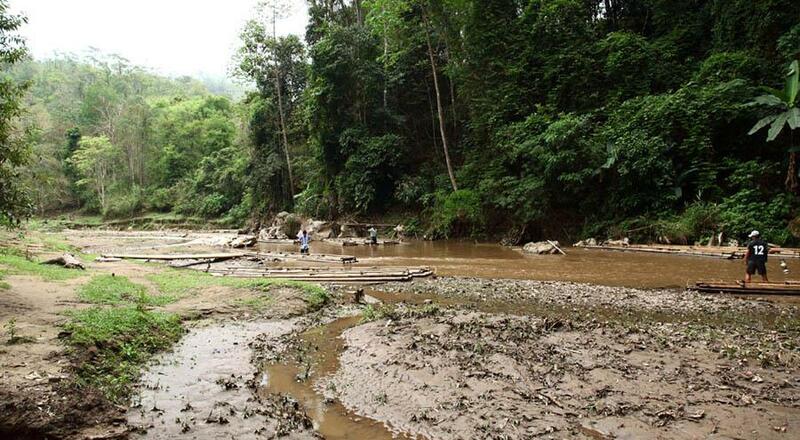 In 1973, there was a huge flood there and it destroyed the bridge. 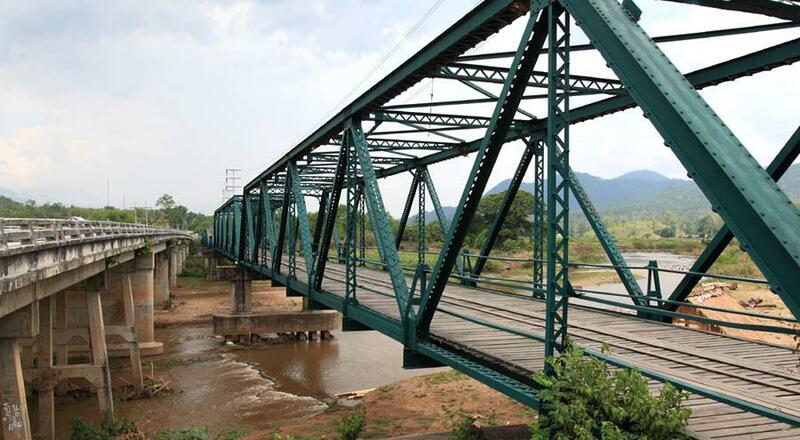 In 1976, the steel Bridge called "Nawarat Steel Bridge" was built and it still remains as a remainder of the history. Walking on the bridge. The way is going on and on. Checking from an angle. Along this bridge, there is another bridge for cars. Looking down from the bridge, calm scenery can be seen. Wat Nam Hoo is another ancient temple of this town. 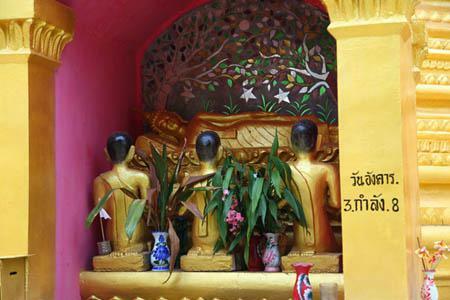 It houses a famous and sacred Buddha image called "Un Muaeng"(Aoon Mueng). Wat Nam Hoo is another ancient temple of this town. 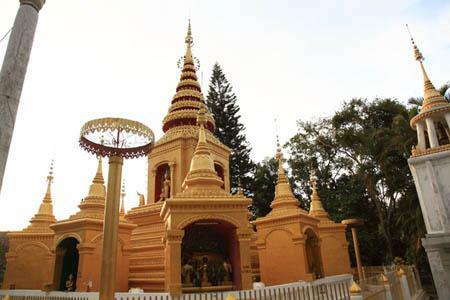 It houses a famous and sacred Buddha image called "Un Muaeng"(Aoon Mueng), the 3rd generation of Singha Buddha, 80cm wide and 111cm high, made of bronze, 500 years of age is situated. 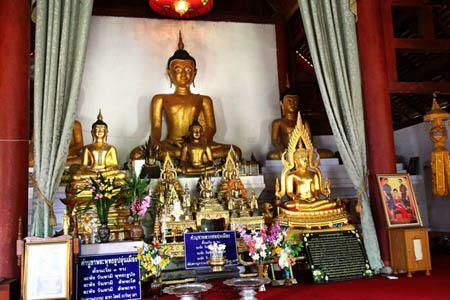 The Buddha image "Un Meuang" is believed that the image was cast by the king Naresuan the great (the King of the Ayutthaya kingdom; 1590 to 1605) for the purpose of royal benevolence for this elder sister "HRH SUPANKALAYA" who had to leave the country to stay in Myanmar as the hostage in the king's palace and later passed away there. 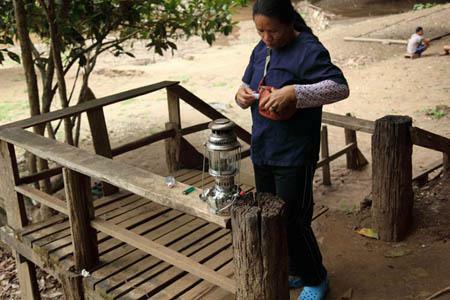 Since the bun of the image could be opened and is always full of holy water, it has become a very respected image for Pai people. 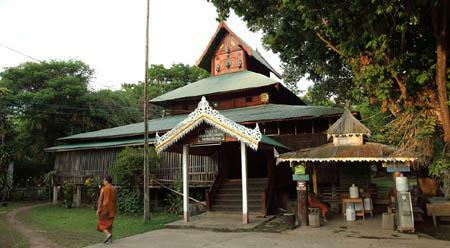 The ashes of the cremated dead and hair of Princess Supankalaya were kept in the pagoda behind the temple. Buddha images housed in the main hall. 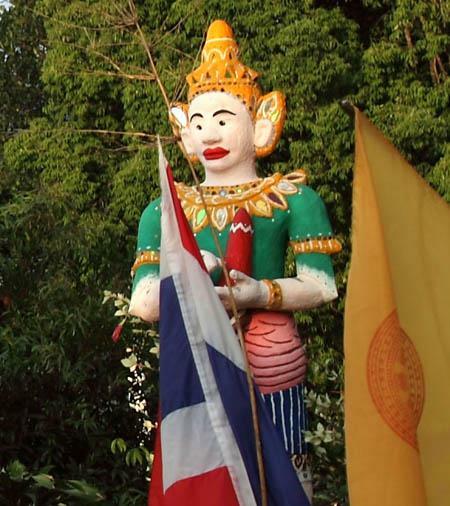 Is this the statue called Un Muaeng (Aoon Mueng) ? 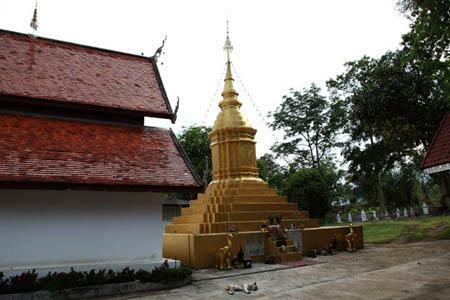 A chedi behind the main hall keeping the ashes and hair of the princess. 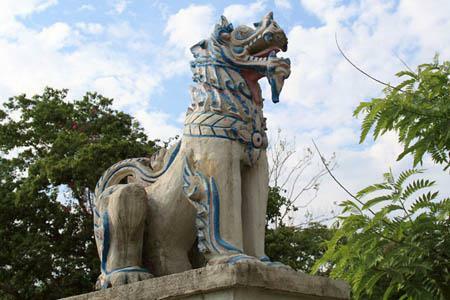 Lion statue protecting the temple. 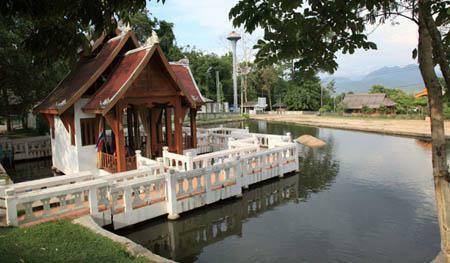 There is a pond in front of the temple showing a quiet and calm place. 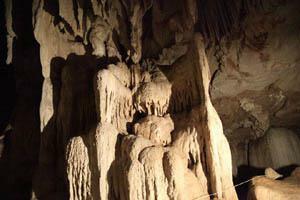 Nam Lod Cave, a very large stalactite cave, about 20 meter in width, 50 meters in height, some 200 meters in length. 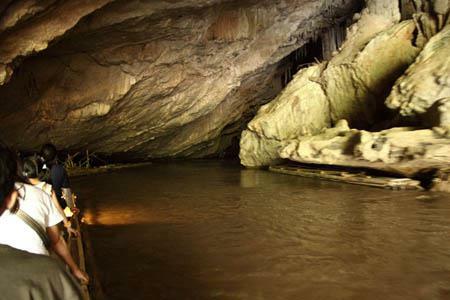 The cave is situated about 8km north of the small market town of Soppong between Pai and Mae Hong Son, about 45 minutes to 1 hour drive from Pai. 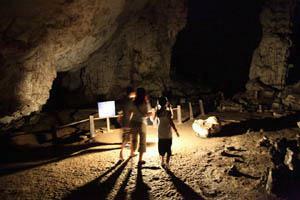 In front of the Nam Lod Cave. 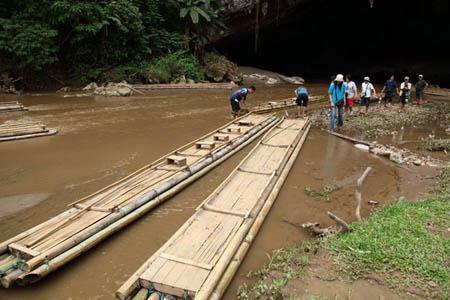 A lot of bamboo rafts are working. 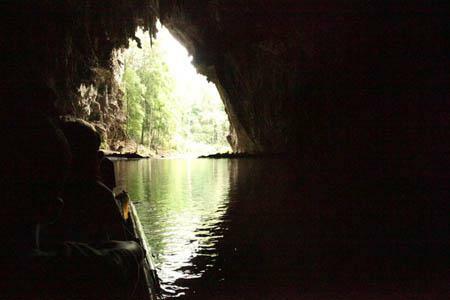 A stream is running through the cave inside. 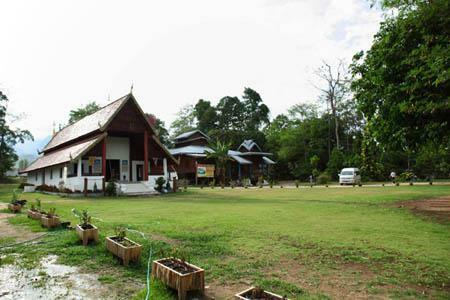 There are several chambers such as Tham Tukkata and Tham Phi Man. 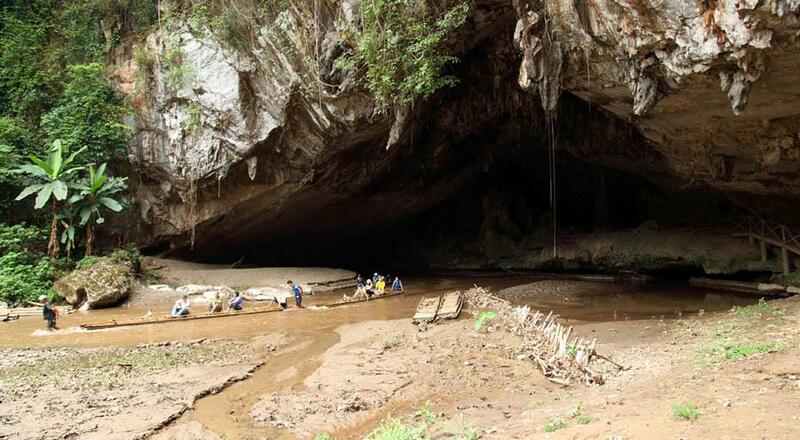 Tham Phi Man is famous for the size like a hall and a prehistoric wood coffin. 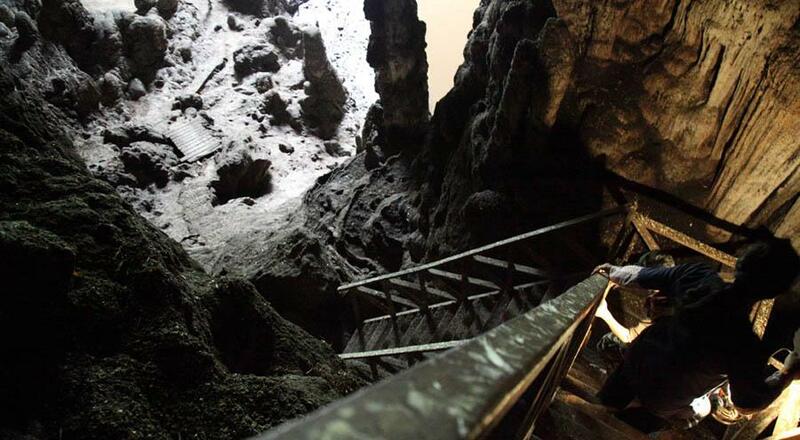 Like other caves, walking ways are not so prepared; There are bridges and stairs in the cave but still you have to walk around along natural and rocky ways. 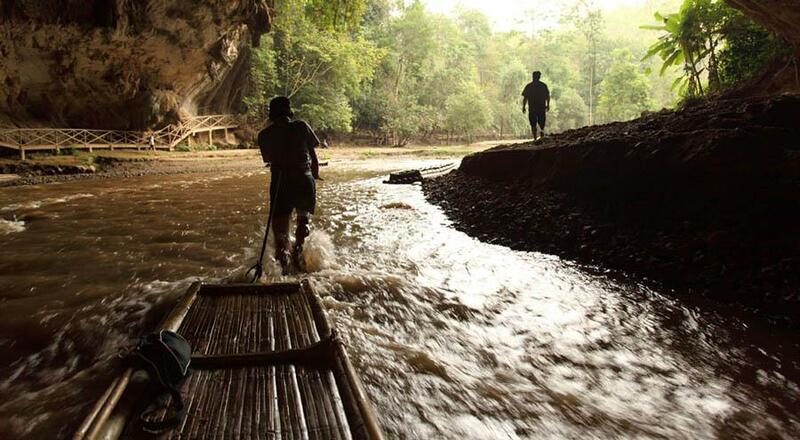 Watch your step if you want to try the cave. You must have a guide with a lantern. You'll enter from the top left and go down to the right bottom. Around the entrance. 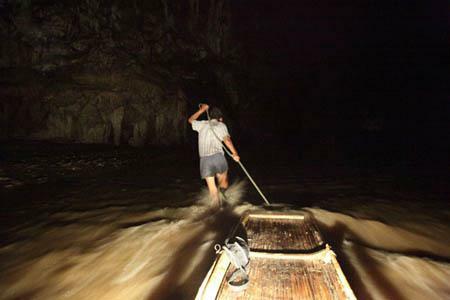 You must have a guide with a lantern. 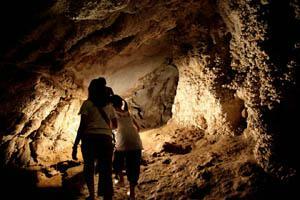 Let's get in the cave ! You can see tourists on rafts. 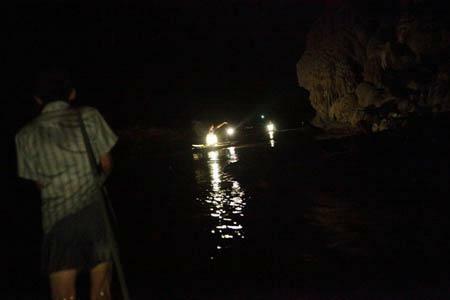 Three visitors on each raft like this. 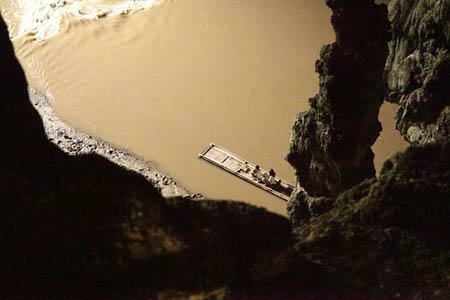 Three visitors on each raft like this. Now, get in. 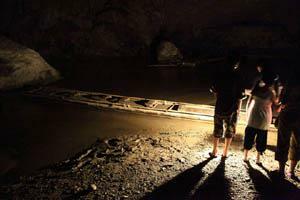 After getting in the cave on the raft, you'll walk on land. 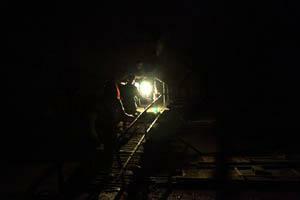 Only the light of the guide can show around. if you don't try to follow her, you'll lose sight of your own footsteps and can't go ahead anymore. 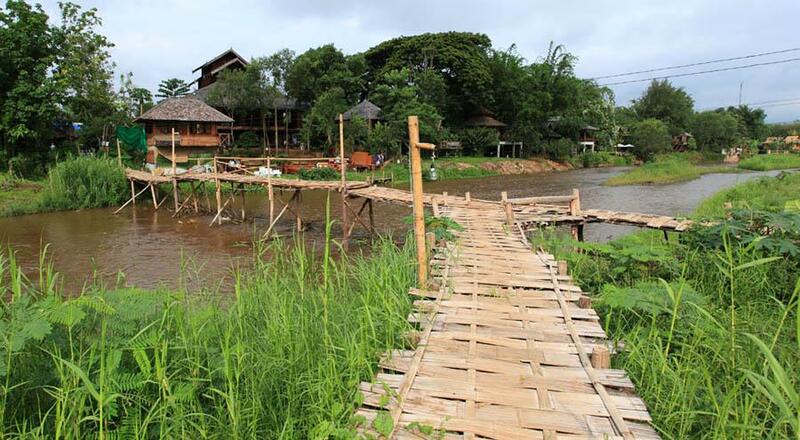 After walking around, you'll get on a raft again. 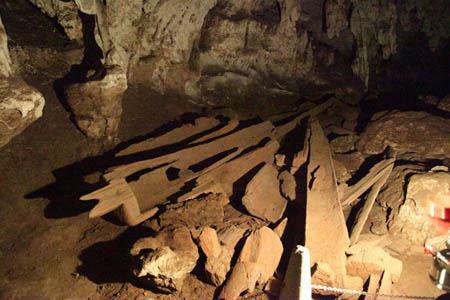 Another side of the cave. You'll reach here on the raft. 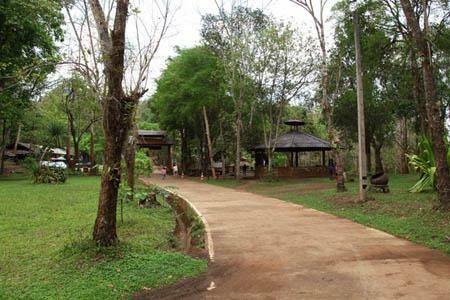 There is a very wide space called Tham Phi Man. 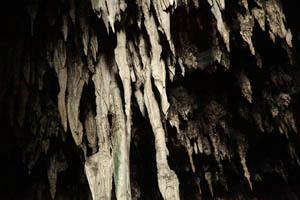 The look of the stalactite cave Another side of the cave. You'll reach here on the raft. 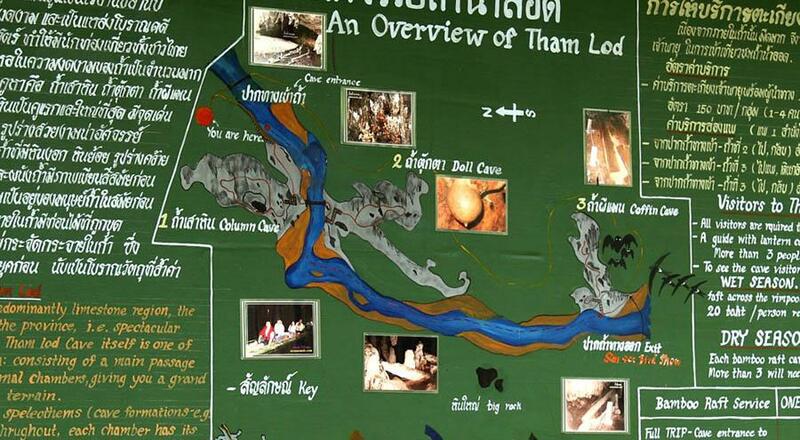 There is a very wide space called Tham Phi Man. 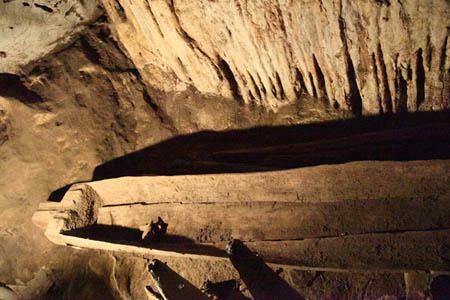 After going up the steep stairs, you can see a prehistoric wood coffin. Other tourists are over there. 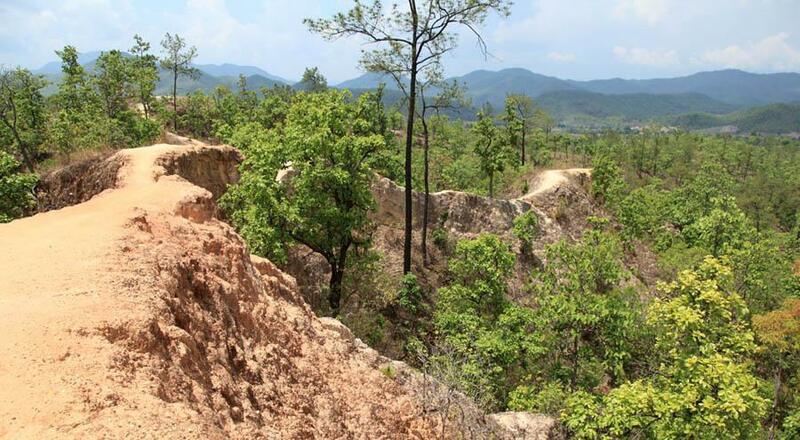 This can not compare with the canyon in the United states, the Grand Canyon (I never been there though), but Pai has a canyon called "Pai Canyon" or "Kong Laen". 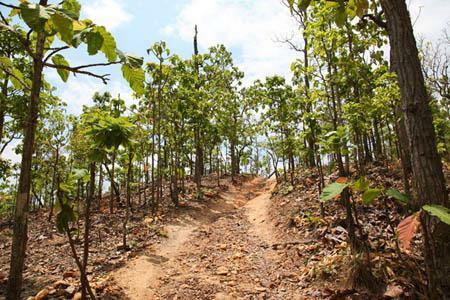 You'll see this unique shape of the land; narrow ways goes on like in the picture. 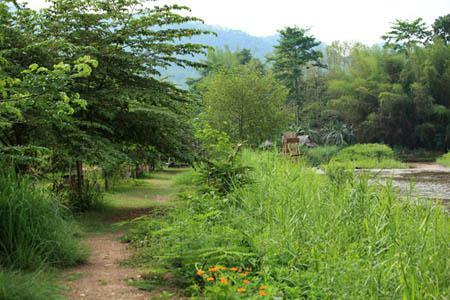 About seven kilometers from the Pai town on the way to the World War II Memorial Bridge, you'll see this unique shape of the land; narrow ways goes on like in the picture. You have to walk up like this place. 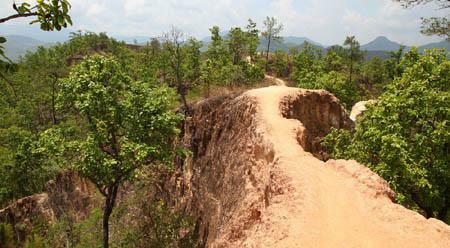 This is the Pai Canyon. The narrow way goes on. 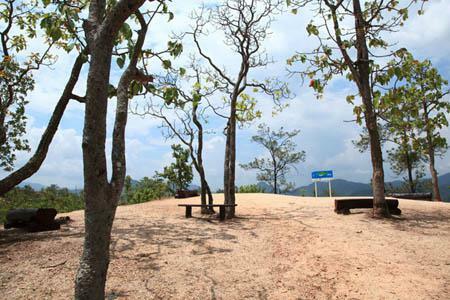 You'll see a wonderful scenery. That would be fine only if the way was narrow. What's more, this is a quite high place. If you fell, it would be so bad. Be careful if you want to try.